While bottarga – a Southern Italian delicacy made from salt-cured, air-dried grey mullet or tuna roe – may not be the most common ingredient to work with, it could be one of the easiest! Sold whole or grated, like this delicious example from Profood supplier Stefano Rocca, bottarga has an intense umami flavour and aroma that’s similar to anchovies, but slightly less salty, and with a silkier texture. 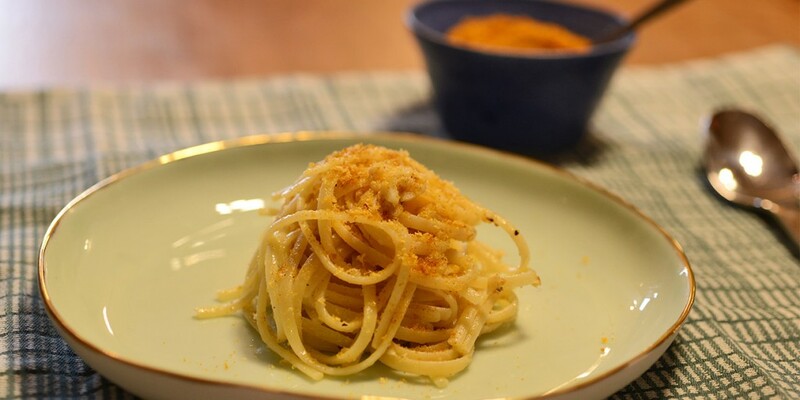 The easiest way to showcase bottarga’s unique flavour is to mix it with garlic and breadcrumbs and add to pasta for an extremely quick and easy lunch dish. Heat 2 tablespoons of extra virgin olive oil in a skillet over medium heat, adding breadcrumbs, garlic, salt and pepper. Cook for 2-3 minutes until the mixture turns a golden brown. Remove from heat, and set aside. Cook your pasta until al dente in a pot of boiling salted water according to packet instructions (my Verrigni spaghetti took 8-9 minutes). Drain the pasta, setting aside 2 tablespoons of the pasta water. Add the grated Parmesan cheese and the water you saved from the pasta pot to your garlic and breadcrumb mixture in a skillet. Add in the pasta, and then toss gently over a medium heat. Drizzle over a little more olive oil, and add 2 tablespoons of grated bottarga, tossing until all ingredients are well combined, before transferring to individual dishes. Season with salt, a little more bottarga and a drizzle of olive oil to taste. Serve immediately and enjoy! For more of Gary’s food adventures, head to his blog Joie De Vivre. Questo elemento è stato inserito in Le ricette e taggato #verrigni, #verrignimood, pasta, ricette.